Church Justice | IS THERE JUSTICE IN THE CHURCH OF GOD IN CHRIST? Here is a new publication which I have come across which discusses COGIC current events. Click here to read the complete FEDERAL COMPLAINT. DON’T TRUST THE TRUST CLAUSE! How many people really know what that means? To put it bluntly it gives the National Church ownership of your property. Since the General Counsel in his official position stated this for the court, that is the position of the Executive branch of COGIC, Inc.
Did you know you are holding your Church for everybody who is part of the national organization? And here you thought it was for the local members. 1. An equitable or beneficial right or title to land or other property, held for the beneficiary by another person, in whom resides the legal title or ownership, recognized and enforced by courts of chancery. See Goodwin v. McMinn, 193 Pa. 046, 44 Atl. 1094, 74 Am. St. Rep. 703; Beers v. Lyon, 21 Conn. 613; Seymour v. Freer, 8 Wall. 202, 19 L. Ed. 300. An obligation arising out of a confidence reposed in the trustee or representative, who has the legal title to property conveyed to him, that he will faithfully apply the property according to the confidence reposed, or, in other words, according to the wishes of the grantor of the trust. 4 Kent Comm. 304; Willis, Trustees, 2; Beers v. Lyon, 21 Conn. 613; Thornburg v. Buck, 13 Ind. App. 446, 41 N. E. 85. An equitable obligation, either express or Implied, resting upon a person by reason of a confidence reposed in him, to apply or deal with the property for the benefit of some other person, or for the benefit of himself and another or others, according to such confidence. McCreary v. Gewinner, 103 Ga. 528, 29 S. E. 9G0. A holding of property subject to a duty of employing it or applying its proceeds according to directions given by the person from whom it was derived. Munroe v. Crouse. 59 Hun. 248, 12 N. Y. Supp. 815. In layman’s terms, what that means is; you give the beneficiary (the National Church) an equitable (think equity as in equity in your house) interest in your Church. Their name does not have to be on the deed. When you join, pay your National Reports, participate and go to the meetings you are on the hook. The attorneys know this but they talk in legal speak where words have a different meaning to them and the civil court than it does to those not trained in the law. This I think is done to deceive, when you want to communicate truth you speak the language your hearer will understand. Different states also handle this differently. Some states use the “Neutral Principle”, that means whatever name is on the deed, that whose it is. Others states use whatever their state law says. The third and the one that is most harmful to the local members is the “Hierarchical Principle”. You should find out which policy your state uses but remember, it could change with the stroke of a judges pen. If the Trust Clause stated it was held for none but the local church members or congregation, it would protect the local church. Because of the Trust Clause, you are owners in name only. Which makes you a sharecropper. IS THE MISCONDUCT RESOLUTION BEING ABUSED? 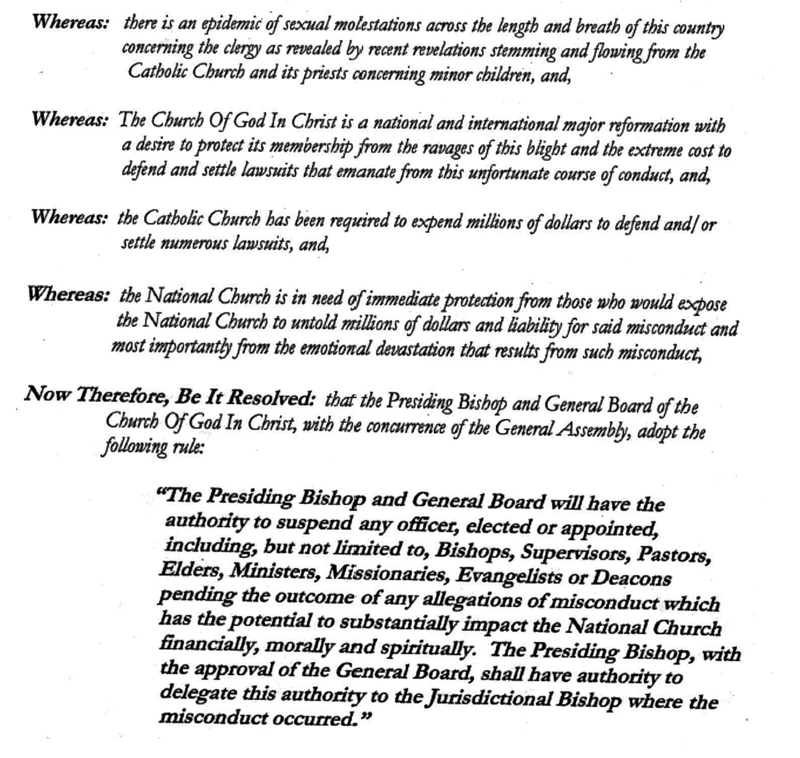 It was originally purported as way to protect the National Church from Misconduct involving Sexual Molestation (See the first and last Whereas). Any conduct of a sexual nature that is non-consensual, including but not limited to sexual harassment and sexual assault, or any behavior that has the effect of threatening or intimidating the individual against whom such conduct is directed. A minor or mentally incapacitated individual can never consent to conduct of a sexual nature. Sexual harassment, which is a form of sexual misconduct, is unwelcome attention, advances, touching, or harassment of a sexual nature that includes a range of behavior from mild, implicit or subtle transgressions an annoyances to overt and blatant activity or conduct than can involve forced sexual activity in an employment environment. This resolution has been misapplied and used as an excuse to deny Pastors their due process under the law of the Church of God in Christ. It is an act of injustice to use this resolution to circumvent the pastor’s constitutional rights of due process when competent, consenting adults are involved. 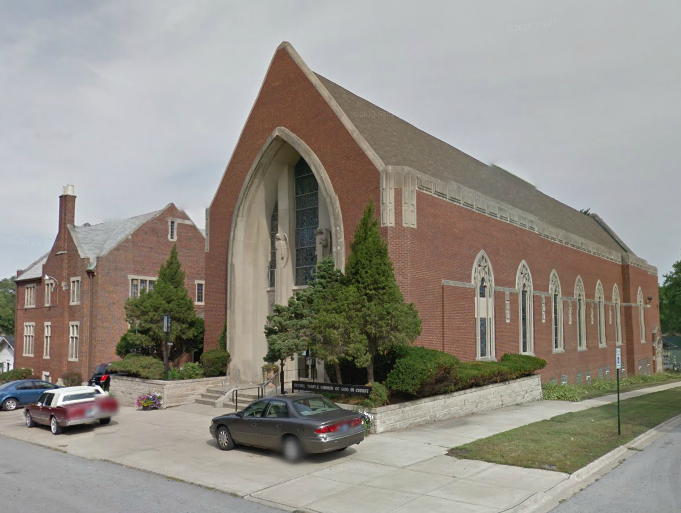 One such case is at the Bethel Temple Church of God in Christ in Gary, Indiana in the Third Jurisdiction of Indiana, Bishop E. Bobby Warren is the Jurisdictional Bishop . When you look at the picture of the church, one wonders if the true motive is the acquisition of the church. 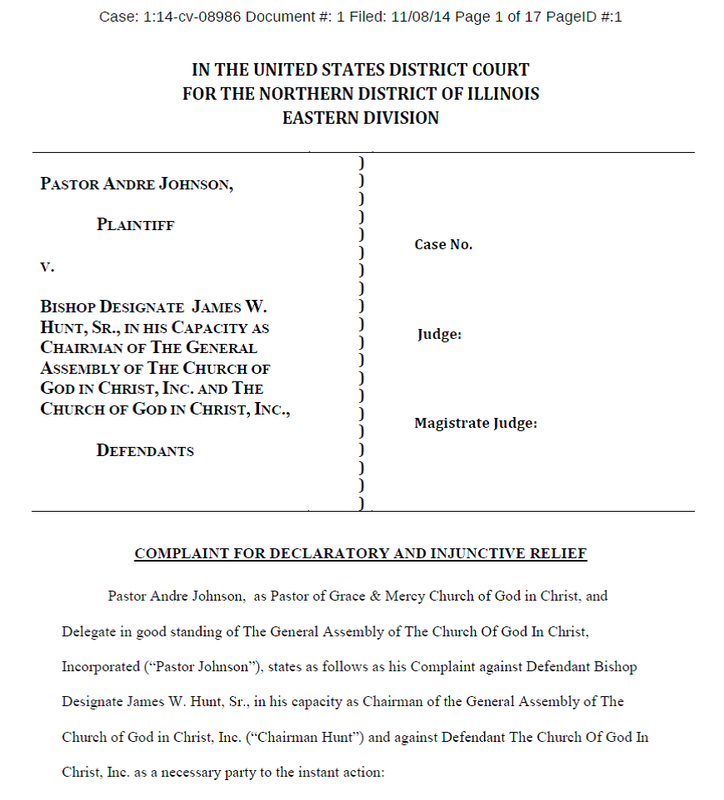 (a) When a majority of the members of the Church Of God In Christ have documented evidence that a Pastor of a local church has committed any or all of the offenses enumerated hereinabove, they may file charges against such Pastor specifically setting out the acts and things complained of The original copy of the charges shall be filed in the office of the Secretary of the Assembly of the Ecclesiastical Jurisdiction of which the Church and Pastor are a pan, or with which they are affiliated, and copies thereof shall be filed in the office of the General Secretary of the Church Of God In Christ at its National Headquarters in Memphis. Tennessee. How will the General Council of Pastors and Elders respond? Will the council require the law be followed?